Nail nippers that will get those tough to cut nails! The Pinkiou Professional Nail Nippers makes cutting thick nails easy! When a standard nail clipper just won’t do the job, it’s time to look for something more heavy duty. This usually comes in the form of nail nippers. 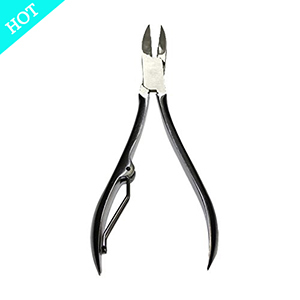 Nail nippers have strong jaws that can open wider than regular nail clippers and apply great force on thick nails. Nail nippers also allow you to steer your cuts so you have more control over where they cut. The powerful blades cut the thickest nails like butter and the double spring design allows for a smooth cutting motion. Combine this with a curved handle to ergonomically fit in your hand and use comfortably for long periods of use, these nail nippers are beautifully crafted for amazing durability, comfort, and functionality. While you’re not using it, use the included cap to cover the sharp tip and blade edges.The Professional Nail Nipper is appropriate for professional use.